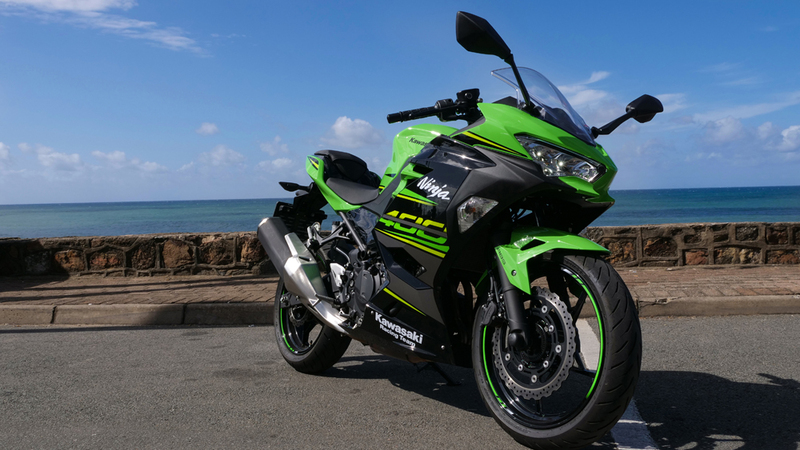 The smallest member of the Ninja family started it’s life as a 250cc, grew to 300, and now, with styling inspired by the championship-winning ZX-10R and the Ninja H2, enter the new Kawasaki Ninja 400 SE. 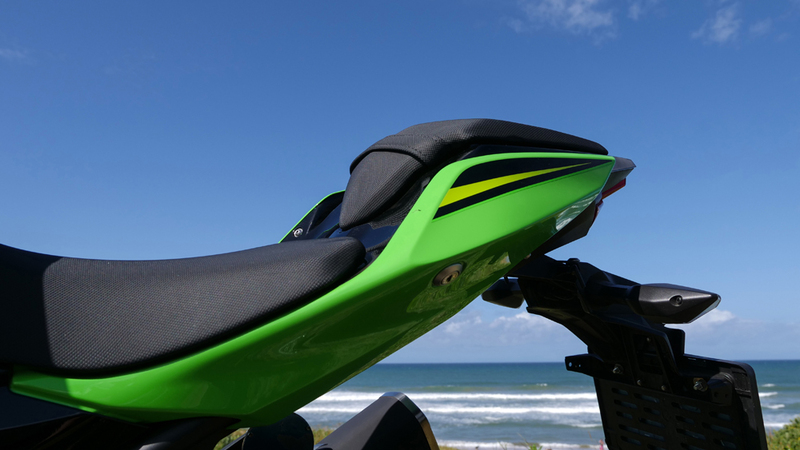 The Ninja 400 is not a face lifted Ninja 300. It has received new brakes, suspension, chassis, rider geometry, wheels and bodywork, making this a completely redesigned motorcycle for 2018. The main difference is the trellis frame inspired from the Ninja H2, which features a shorter wheelbase and steeper rake over the previous model. 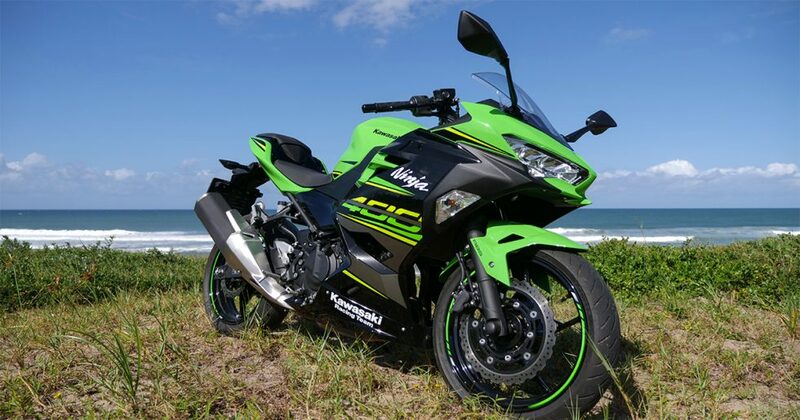 Kawasaki impressively has made the 400 Ninja 8kg lighter than the 300, tipping the scales at 168 kg. 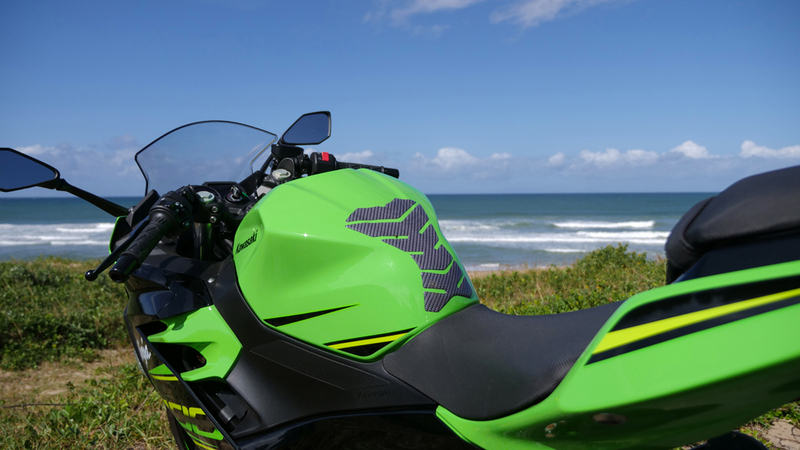 The Ninja 400 doesn’t just leave the traffic behind, it also punches way above it’s weight from robot to robot. The plucky little 399cm³ parallel twin engine pulls well enough at low revs, and produces a noticeable added kick from above 7 000 rpm and lays down 45hp at 10 000 rpm, with a Max Torque output of 38Nm. The Engine loves being revved out like a sports bike, with a red line at 12 000 rpm It is a pleasure to ride on the highway in where it allows you to travel at a comfy 120 km/h at only 7 000 rpm. Top speed of a motorcycle is always a contest in every motorcycle category and this Ninja tops out on a level road at 192 km/h, which is decently fast for a 399cc motorcycle. 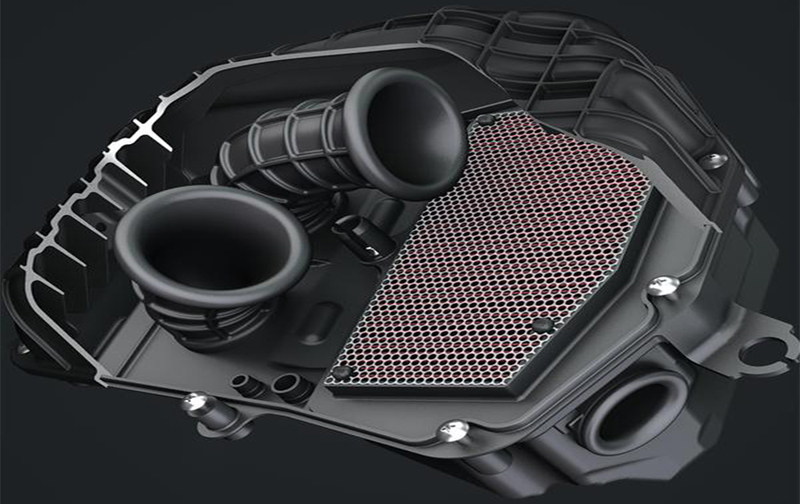 Engineers at Kawasaki maintain that a lot of the bike’s power gains are fulfilled by utilizing a new downdraft intake with a larger air-box. What impressed me almost as much as the bike’s new found power, was the deeper intake note, which gives the bike a mean growl at 6 000 rpm and upwards. What I found enjoyable and practical for everyday use was the assist & slipper clutch which gives you a lighter clutch lever pull, and when downshifting fast, there was no chatter or bouncing rear wheel. 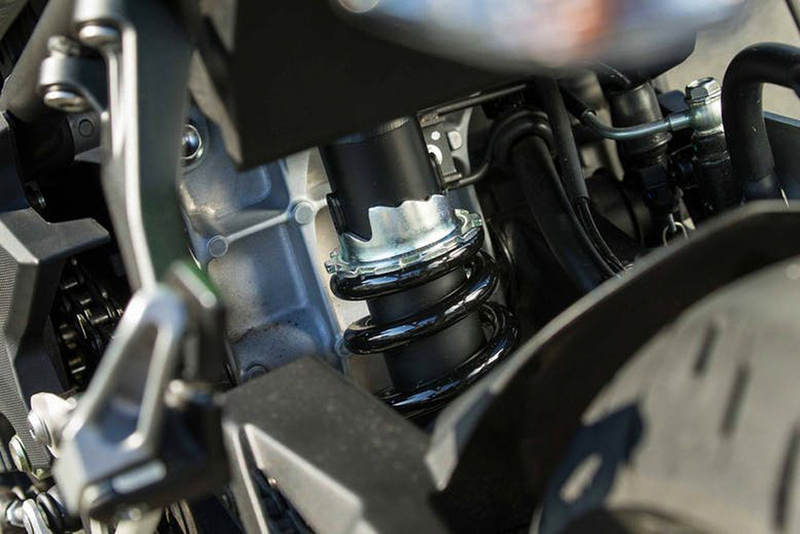 The Ninja 400 is fitted with non-adjustable, traditional Showa front forks and a five-position adjustable preload ring on the rear KYB bottom-link Uni-Trak shock. Although the suspension is non-adjustable, (barring in mind the rear preload), it was no real loss to me, weighing in at 69kg’s, the set-up is spot-on for riders of similar weight. The forks have grown in size from 37mm to 41mm and provide a firm, precise ride that is enjoyable during sporty riding and comfortable around town. 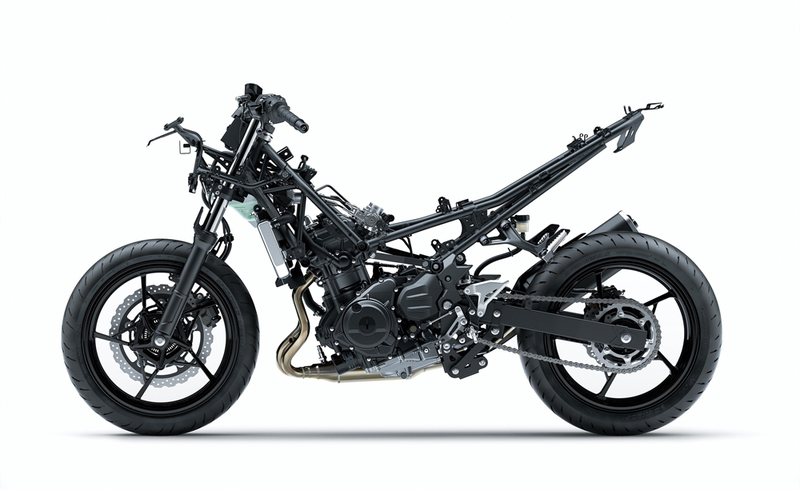 Overall the bike’s balance is remarkable thanks to the new trellis frame which uses the engine as a stressed member and has the swing-arm mounted directly to it. The brakes are bigger as well, with the front rotor up 20mm to a full-sized 310mm. 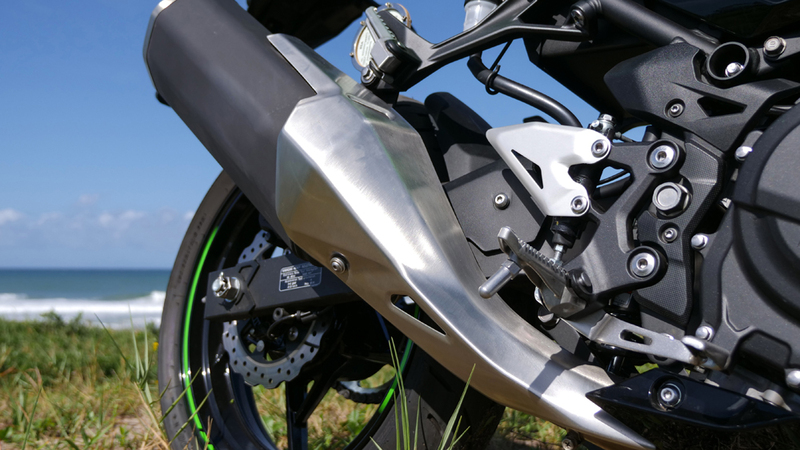 The new Ninja 400 now uses dual-piston Nissin calipers at the front and the rear, with Nissin’s newest ABS control unit available as an option. 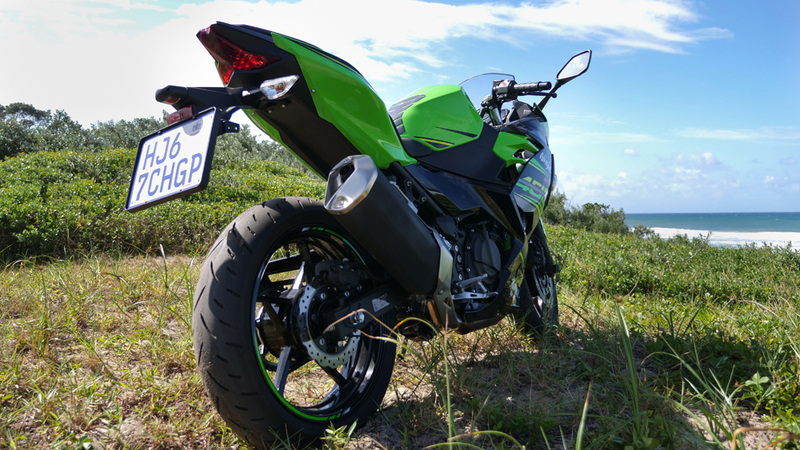 Over the past 2 weeks the Ninja and I got the chance to ride in all sorts of weather, and having the ABS option made my life so much less stressed on oily and rainy South African roads. The ABS cannot be disengaged, so if you are a track rider then you could save a few rand and go for the none ABS model. 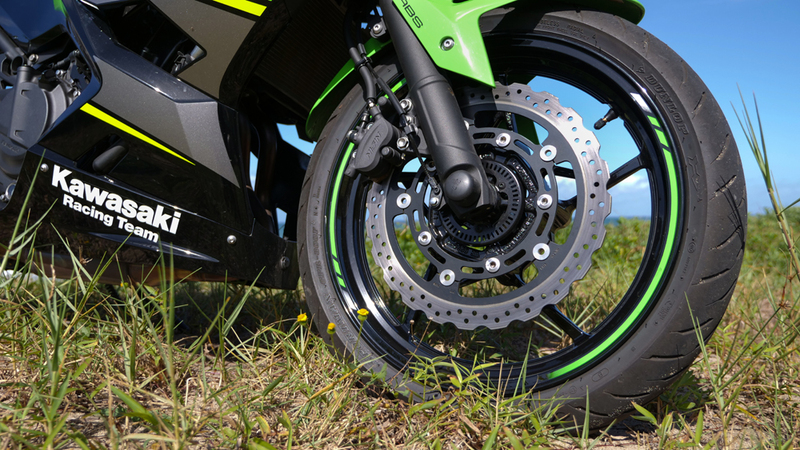 When it comes to brake feel, the initial bite is not instant and the brake lever is non adjustable, but after riding for a while it becomes predictable and second nature when getting on the anchors. The Ninja comes armed with Lean LED headlamps which gives the Ninja 400 a mean, sharp, aggressive look, so much so that I have nicknamed our test bike “The Gremlin”. The headlamps each featuring low and high beams that are highly visible and offer significantly increased brightness compared to the Ninja 300. The new five-spoke mag wheels look awesome! and wearing the Dunlop Sportmax GPR-300 radial tyres with a 110/70R17 at the front and a 150/60R17 at the rear – they are also functional too. Original tyres that come fitted on bikes are often a let down, but it was quite the opposite in this case. At times the bike leaned lower than what I expected, pushing me to the point of deciding to suit up and drag a knee. The clip-on handlebars still feature the same amount of rise, but are pulled 15mm closer to the rider, while the foot pegs are moved 9mm backwards. The seat height remains the same at 785mm and provides an easy reach to the ground, even for short riders. The seat itself has thick cushioning and low-rebound urethane, all which contributes to a superb comfortable ride. At 170cm tall the cockpit fitted me like a glove, however with a size 8 shoe I did have issues with my heel hitting the exhausts heat shield whilst riding on the ball’s of my feet. 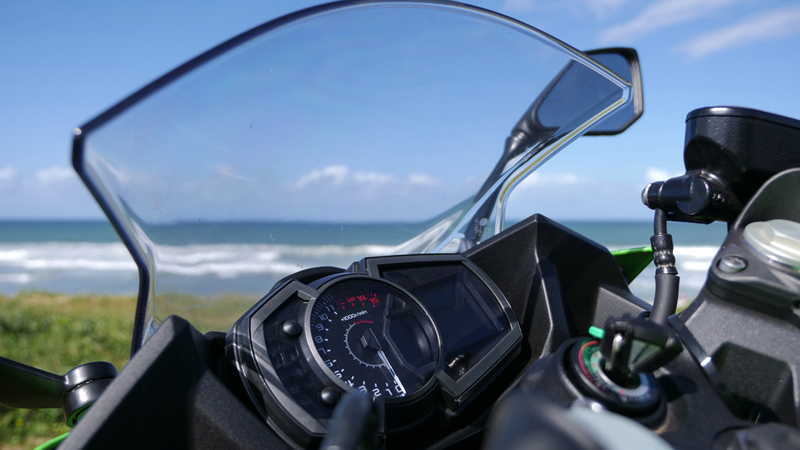 Clocks are from the Ninja 650 and comprise an analogue tacho plus an LCD panel displaying speed, fuel, trip, km/l average, as well as a current and a very useful gear indicator. Overall fit and finish is excellent and on a par, if not better than current competitors in it’s class. Even though the Ninja 400 doesn’t have an adjustable screen it did it’s job just fine. 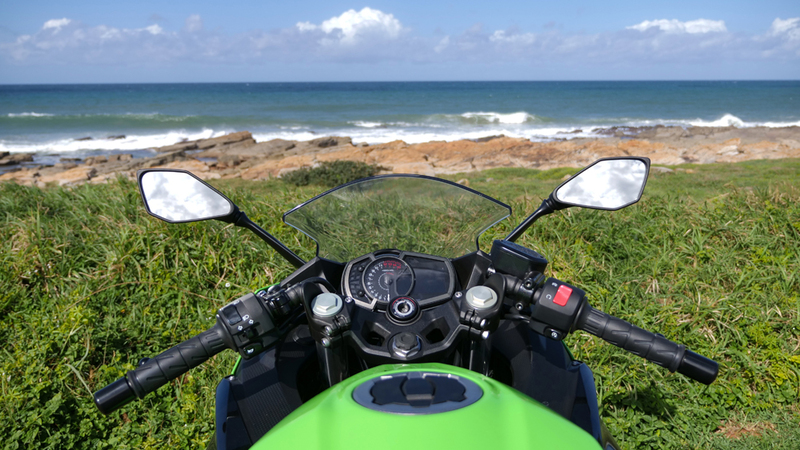 If you are a taller rider, Kawasaki do make larger screens which are 20mm taller and 40mm wider. 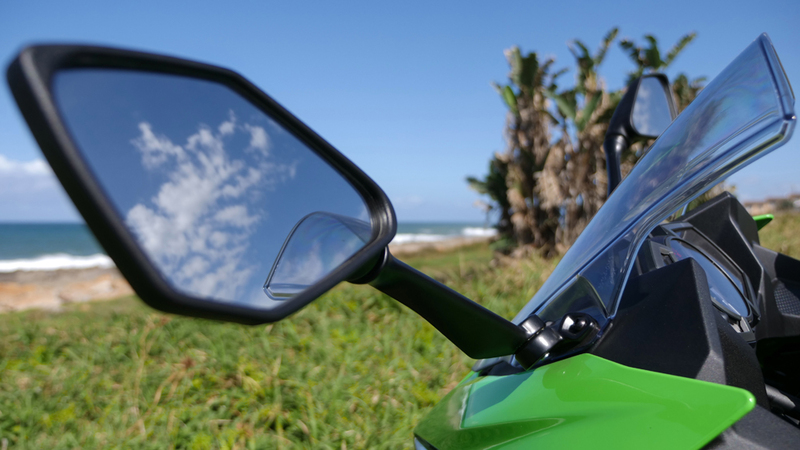 The mirrors stick out a fair bit, and more than on the Ninja 300, whilst lane splitting it can give you that hesitant feeling where you ask yourself am I going to fit? When it comes to function they work well with minimal vibration and they can be slightly adjusted, I say slightly because you can only move the mirrors and not the stems. After riding the Ninja 400 for five days and just under 1 000 km, I can report that I managed, on a good day, to get an average fuel consumption of 27 km/l. You can expect to get between 20 and 23 km/l when riding briskly or in typical rush hour traffic. A 14 litre tank is what you get, and with those 14 litres of fuel I managed 322 kilometres in which there was urban, sporty and highway riding involved. When I just got into high school, 125cc bikes were known as beginner bikes and if you had a 250cc, you were the man. Kawasaki changed that with the Ninja 300 and now with the 400 Ninja. 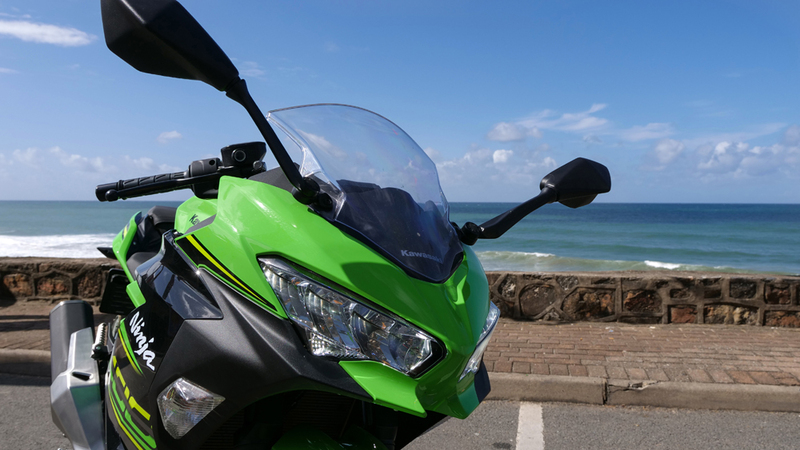 Kawasaki have managed to build a bike that is suitable for a beginner, yet exhilarating for pretty much anyone. What amazed me the most whilst riding the bike and gathering notes for this review, wasn’t how good this bike is for a beginner, but rather how good a motorcycle it is, period! Whether you’re a new rider who wants something that transmits a big-bike style, or you’re a skilful rider looking for a lightweight backroad carver or track-bike, that will cost very little to maintain – the Ninja 400 is certainly going to appeal to a wide variety of riders.